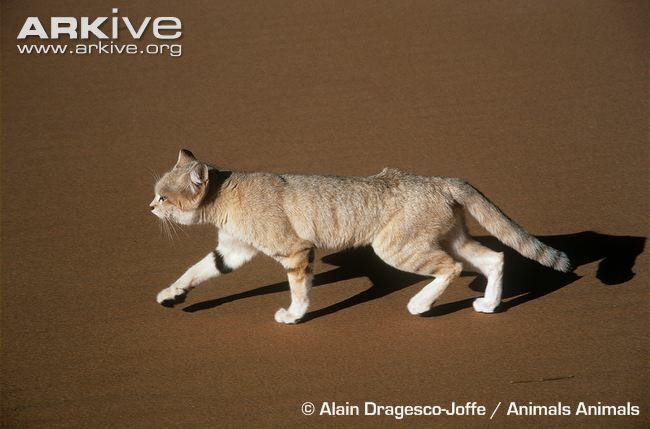 SIZE The Sand Cat is the only slightly larger than the Black-footed Cat (the smallest African cat) weighing up to 3.4 kgs, about the size of a very small domestic cat. Males are larger than females. BODY The small body is stocky with short legs and a relatively long tail. There are mats of dense fur, up to 2 cm thick, on the pads of the feet. These help protect against both the extreme desert heat and cold temperatures, and also assist with walking on the loose sand. COAT The light brown coat has greyish fur on the back with some feint markings and plain pale fur below. There is striping on the limbs and usually two dark bars on the forelimbs. The long tail has a few dark rings towards the end and a black tip. 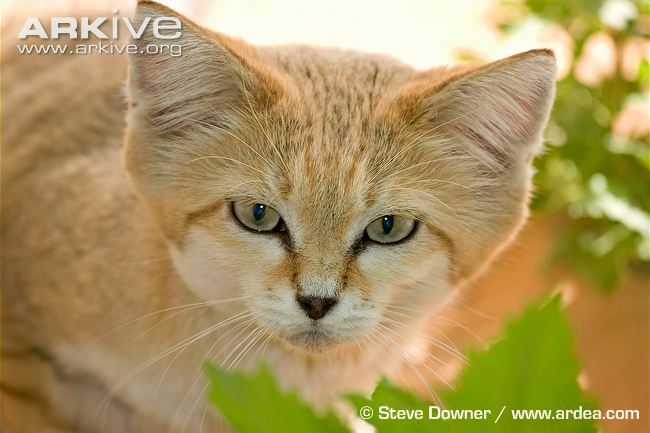 HEAD The Sand Cat has a wide face with thick white fur around the mouth and chin. There are feint diagonal red lines from the outer and inner corners of the eyes towards the edge of the face. The large triangular ears are set low on the side of the head and have thick white hairs inside. The back of the ears are brown on the base and have a black tip. AGE In the wild - unknown. In captivity - up to 14 years.